Published by The Writers Trust, 2019. This is the book that’s been missing, the one that every writer, beginner or master, must read. This is how to write. This is how to live. This is how to achieve authenticity. Please, read it. Live by it. This book is a special contribution to the literary world. It reveals a world of knowledge learned and earned from a man who has dedicated his life to literature. 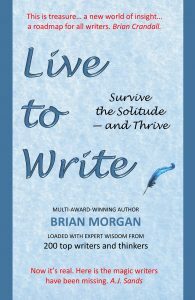 Author Brian Morgan masterfully orchestrates insights, quotes and quips from writers past and present. He has gathered his own gems over the years as he read and learned from Thoreau, Faulkner, Tolstoy, Angelou, and so many more. Live to Write is an encyclopedia of knowledge, creatively expressed. It’s a road map for an aspiring writer. This book is a Middle Earth, a new world of learning for all writers. Live to Write is a treasure, opened and shared with all. Brian Crandall, author of Empathy Globally: Painful Portraits of People – in Poetry. Trust Brian Morgan. He has touched the depths of life and searched the world for wisdom. His motives are authentic and his heart is an open book – this book. This book is going to be an amazing blessing to the world… It is a rare topic indeed… I am planning to write a book on solitude but you beat me to it… You are actually resolving a big problem in the world by writing this book. [Writers who have to cope with isolation and solitude] will now have a reference point. Thank you for doing the work. This is a book with a forever message for writers everywhere, whatever the stage of their writing journey. Must have. Must keep. I never thought I’d find a book like this for writing. My notebook is full of advice I wish I had years ago… priceless wisdom… This is that rare book that can change your life and your work. This is not a book – it’s an inspiration package for all writers in their dungeons. Brilliant. I’ve been writing for five years and I was stuck, going nowhere. But today is a new day. Today it’s real. This is the magic writers have been missing. I’ve started reading it again, there’s too much to absorb in one reading. I’ve read many books on writing, but never anything like this. This gets down to the core of how to not only survive, but thrive as a writer. Every writer should keep this book within reach and never go into the cave without it. I should have expected something like this from you, Brian. You are an inspiration on social media and a constant friend to everyone who wants a hand. Yes, I want to thrive as a writer and I’ll read this book again, And again and again. There is nothing remotely like it. Thank you. William Fitzhenry, writer/reviewer.